foreign body can be defined simply as any object or entity found in an organ or tissue, in which it does not belong in the normal circumstances, that has been introduced from outside. Foreign bodies in the maxillofacial region may present a diagnosticchallenge because of many factors such as:- The size of the object.- The difficult access.- Close anatomic relationship of the foreign bodies to vital structures. Indications for removal:In general, foreign bodies in the maxillofacial region should be removed.Superficial foreign bodies are usually easy to remove if seen. However, penetrating foreign bodies are more difficult to remove.Indications for removal include:1. Neurovascular compromise.2. Evidence of infection.3. 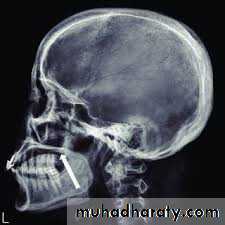 Cosmetic deformity.4. Functional impairment.5. Chronic pain.6. Patient's request. Contraindications for removal:1- Deep inaccessible foreign bodies or those that require extensivedissection.2- Patients with clotting or bleeding disorders, or when the generalcondition of the patient does not permit.3- Inadequate information on the position of the foreign body.4- Cosmetic deformity related to the process of removal. Complications:1. Complications due to the process of removal include additional surgical trauma caused by enlarging the wound or creating an additional one, 2. 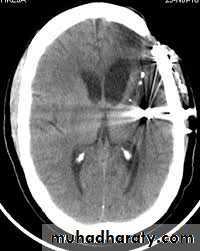 Infection represents the most common late complication, and it isusually a sequel of retained foreign bodies.3. Foreign bodies can modify the regional anatomy because of theinflammatory response in the surrounding tissues and scarring. Imaging: the selection of the imaging modality to detect a foreign body should depend on its position, composition and size. Imaging modalities used are as follows:1. Conventional radiography: it is a noninvasive, inexpensive modality;multiple views are needed (at least 2 views: anteroposterior andlateral).2. Computed tomographic (CT) scan: it has a very important role invisualizing and locating foreign bodies, even radiolucent ones; it alsoprovides information about local anatomy, tissue reaction, and abscess formation. 3. Fluoroscopy: C-arm imaging equipment allows for real timeradiographic visualization of the foreign body.4. 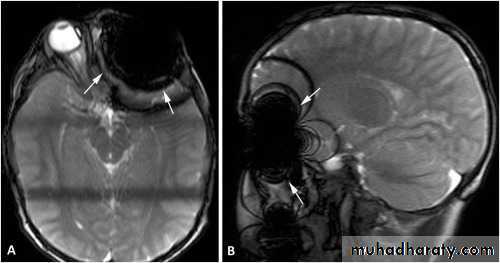 Magnetic resonance imaging: it is used in nonmetallic foreign bodies; it provides detailed information regarding tissue reaction.5. Ultrasonography. 6. A variety of equipment to assist in the removal of foreign bodies has been described such as; endoscopic assisted removal of foreign body, the use of metallic detectors, earth magnet, and the use of navigating system. Examples of retained foreign bodiesBroken needlesIt is a rare complication in local anesthetic injections, the majority ofcases are reported to occur in inferior alveolar nerve and posteriorsuperior alveolar nerve blocks. 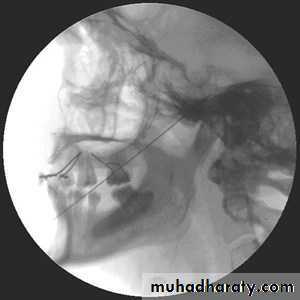 Fractures of long disposable needlesmostly occur at the hub, but since long needle is unlikely to be inserted to its full length into soft tissue, some portion of the needle remains visible in the patient's mouth and retrieval of the fragment with a hemostat is easily accomplished. Some factors that may lead to needle breakage:1. Intentional bending of the needle by the doctor before injection.2. Sudden unexpected movement by the patient while the needle is still embedded in tissue.3. Forceful contact with bone. Management:* Needle breakage is not a significant problem if the needle can be removed without surgical intervention. The visible proximal end of the broken needle should be grasped by a hemostat and removed from the soft tissue. * When the needle has been inserted to its hub, the broken fragmentwill not be visible when the syringe is withdrawn from the patient'smouth. The needle fragment remaining in the tissue poses a risk ofserious damage being inflicted on the soft tissues for as long as thefragment remains. Needle fragments can migrate. 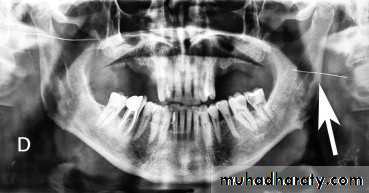 The patient shouldbe instructed to avoid excessive jaw movement. reference during exploration and also provides greater protection to the inferior alveolar and lingual nerves, supra-periosteal blunt dissection may be needed to identify the needle. inferior alveolar nerve block in adults or larger children. *Do not bend needles when inserting them into soft tissue. absolutely essential for the success of the injection. *Observe extra caution when inserting needles in younger children or in apprehensive adult. * Avoid major changes in position of the needle during administration. Projectiles in the form of bullets or fragments of explosive devices result in a complex pattern of trauma that consists of comminution, loss of bone, and soft tissue avulsion. 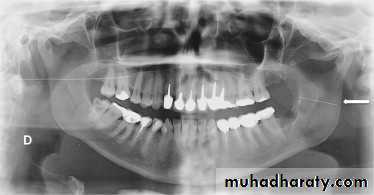 Penetrating missile injuries represent a common cause of retained foreign bodies that can remain buried deep within the maxillofacial region. They appear as radioopaque mass, and localization is very important for surgical removal. is difficult to be removed. Amalgam can be incorporated into the oral mucosa in several ways; broken amalgam pieces can dislodged into extraction sockets. If dental floss becomes contaminated with amalgam particles of a recently placed restoration, then linear areas of pigmentation can be created in the gingival tissues as a result of hygiene procedures. 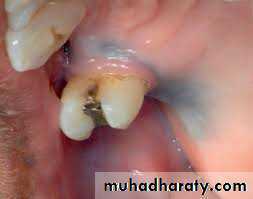 Amalgam from endodontic retrograde filling procedures can be left within the soft tissue at the surgical site. Glass fragment may become embedded in the soft tissue at the time of an accident. Glass is radiopaque, and its radiopacity does not depend on its lead content or other metal content, but this visibility depends on the size of the object. Very small pieces of glass buried deep in the soft tissue may not be visible. macule usually in hard palate of young patients which may be similar to other pigmented lesions, they may cause foreign-body reaction. A history of injury could confirm the diagnosis of a foreign-body lesion. are radiolucent and may be difficult to demonstrate and locate.